The seeds market is valued at USD 59.71 billion in 2018 and is expected to register USD 90.37 billion in 2024 witnessing a CAGR of 7.9% during the forecast period 2019-2024. In 2018, North America was the largest geographical segment of the market studied and accounted for a share of around 35% of the market. The growing demand for grains, oils, and vegetables is a significant driver for the seeds market. The global population reached over 7.6 billion in 2018 and is expected to reach 9.9 billion by 2050. As a result, the global demand for food is likely to increase by 70%, due to rapid population growth, urbanization, and changing diets. Grains represent the biggest portion of daily calorie intake in developing countries of the Middle East & Africa, Asia/Oceania, and CIS, and therefore, the demand for grains is going to be one of the most critical drivers of the market studied. A seed is the ripened fertilized ovule of a flowering plant containing an embryo and capable normally of germination to produce a new plant. For the purpose of this report, seeds have been defined as the seeds for sowing at farmer level. In this report market sizing has been at the farmer level. The report provides an in-depth analysis of various parameters of the seeds market. The market has been segmented based on the type of product, crop, and also based on geography. Also, relevant sub-segmentations have been discussed in the report. The massive increase in the demand for biofuel is majorly determined by the very large subsidies provided in many western countries, which have been simultaneously increasing the subsidization of biofuel, along with a reduction in subsidies on food cultivation. The production of global biofuels increased by almost 150%, between 2004 and 2010, from 42 billion liters to 104 billion liters, respectively. 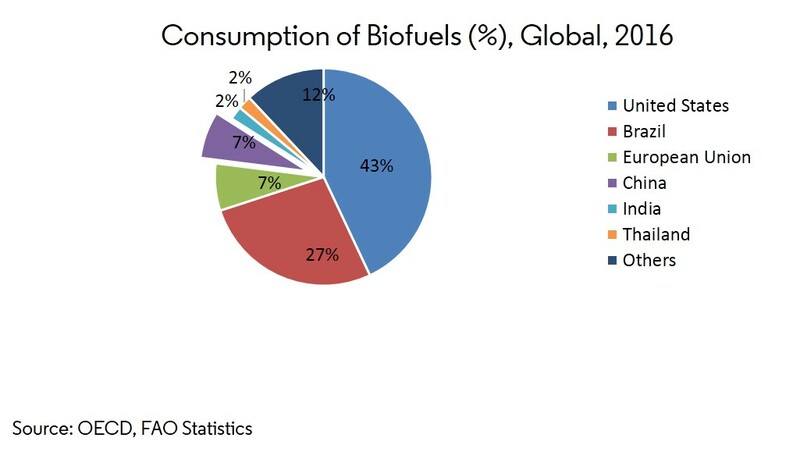 As per an FAO report, the biofuel boom had a major impact on the evolution of world food demand for cereals and vegetable oils. Moreover, it states that without biofuel, the growth rate of world cereal consumption is equal to 1.3%, as compared to 1.8% of biofuel. This acts as a major driving force for the expanding market under study. 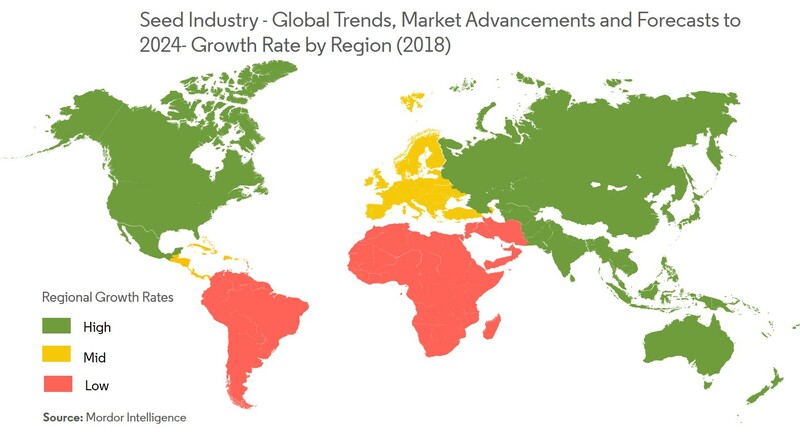 The North American seeds market was valued at USD 20.91 billion in 2018, serving the farmers mainly in grains, cereals, fruits, vegetables, and oil and forage crops. 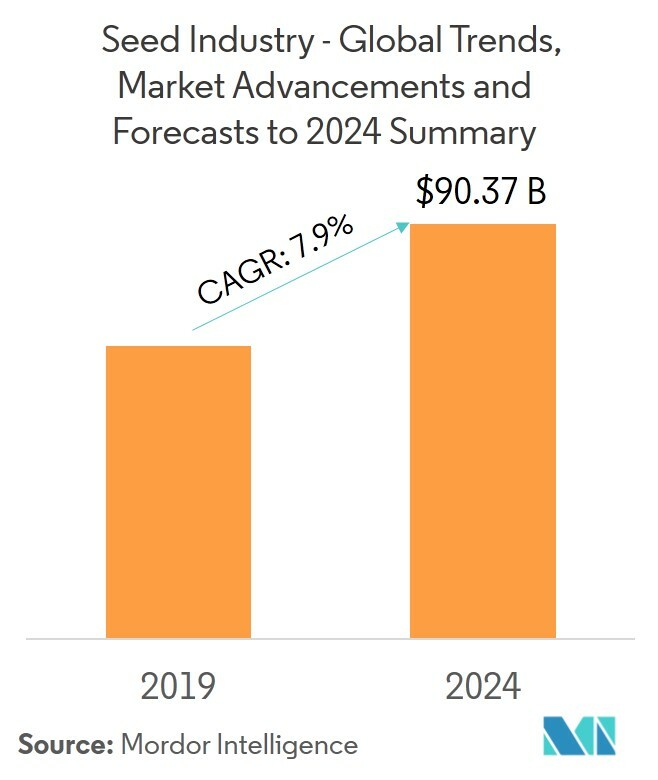 The market is expected to reach USD 30.9 billion by 2024 and is estimated to register a CAGR of 6.46%, during the forecast period. North America is the largest commercial seeds market, accounting for more than 35% of the market share. 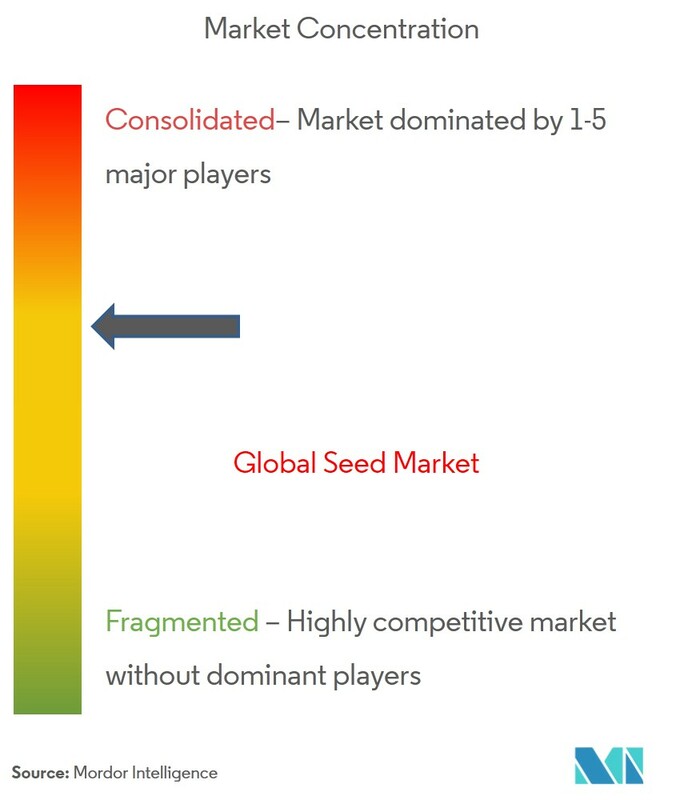 The seeds market is moderately consolidated, with the top 8 companies accounting for around 50% of the market, while rest is accounted through local companies. The market is expected to get more consolidated once the recent acquisitions take full effect on the company’s operations and sales. 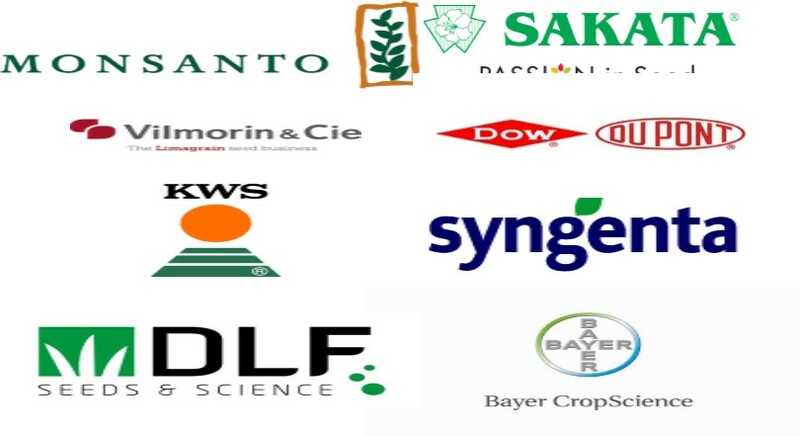 Monsanto, Vilmorin & Cie., Syngenta, DowDupont Inc, Bayer, and DLF Seeds are some major companies in the market.